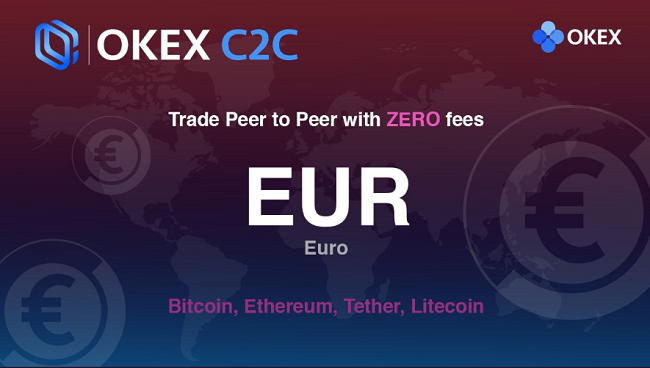 Cryptocurrency exchange OKEx has announced the expansion of its C2C fiat-to-token trading platform to European markets with new currencies – Euro (EUR), Turkish Lira (TRY), and Russian Ruble (RUB). European investors trading on OKEx would be able to enjoy a broad range of trading services, including C2C, spot, margin, and derivatives, with unparalleled convenience and security at one stop. "We are so thrilled about the expansion as our C2C platform is fostering the buying and selling of digital assets across Europe with the newly supported currencies," said Andy Cheung, Head of Operations of OKEx. "Given the recent Bitcoin price rally, the whole crypto market is giving a strong signal. We have good faith in the growth and development of blockchain technology under this bullish trend." Launched in December 2017, OKEx C2C fiat-to-token trading service offers a decentralized platform for the buying and selling of Bitcoin (BTC), Tether (USDT), Ethereum (ETH), and Litecoin (LTC). Euro (EUR), Turkish Lira (TRY) and Russian Ruble (RUB) markets are now available on the platform. Users can place orders with self-selected exchange rates and payment methods to buy or sell Virtual Financial Assets with fiat currencies. In December 2018, OKEx launched an instant messaging service for C2C Trading. OKEx also offers multi-lingual support with currently ten different languages – English, Turkish, Deutsch, Traditional Chinese, Spanish, French, Russian, Thai, Vietnamese and Indonesian – on its website.